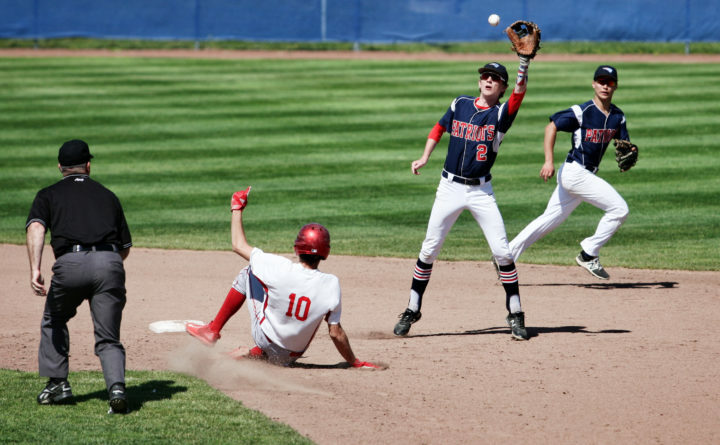 Fort Fairfield's Isaac Cyr, left, slides safely into second base as Bangor Christian's Jackson York has to go up high to catch the ball during Wednesday's Class D North baseball championship at Mansfield Stadium in Bangor. Backing up the play is BC's Erik Gorczok. BANGOR, Maine — One of the hardest decisions a high school baseball coach faces during postseason play is how to handle a pitching staff. The availability of staff aces and team-wide depth play pivotal roles, as do pitch counts and arm fatigue as the regular season gives way to the win-or-go-home pursuit of playoff success. Bangor Christian coach Tim Collins faced a gut-wrenching decision during Wednesday’s Class D North championship game at Mansfield Stadium, with staff ace Dean Grass — coming off a complete-game performance in last Saturday’s semifinal — pitching a no-hitter but tiring midway through the contest and the Patriots still three innings from a second straight regional title. So Bangor Christian turned to its bullpen, and Fort Fairfield rallied from a 2-0 deficit for a 4-3 victory and its first regional crown in 24 years. “Dean had thrown 139 pitches combined (between the semifinal and final), and I really anticipated that by the fifth or sixth inning that he would start to fade even though he was pitching wonderfully,” said Collins. “The combination of the anticipated arm fatigue and my seniors wanting to win the state title and knowing that our best chance was with Dean on the mound (at states), we rolled the dice. Fort Fairfield coach John Ala was sympathetic to Collins’ dilemma. “Surprised, no, it was a tactical move,” said Ala, whose team was playing in its third straight D North final. “(Collins) was looking at possible states on Saturday and sometimes as a coach you have to gamble a bit. They’re a bit of a different team when he’s on the mound so if you move on you’d want to have him back. The victory advances top-seeded Fort Fairfield (15-2) to Saturday’s 3 p.m. state final at Mansfield against Richmond, a 14-6 winner over three-time defending state champion Searsport in the D South final. Bangor Christian, which defeated Fort Fairfield 9-3 in the 2017 D North final, concludes its season at 14-5. Senior right-hander Jared Harvey was a two-way key to victory for Fort Fairfield, pitching a complete-game five-hitter and rapping a two-run triple as the Tigers scored three runs in the bottom of the fifth to take its first lead. Walks to Alex Sprague and Malcolm Langner put runners on first and second with one out in the Fort Fairfield fifth. BC righty Erik Gorczok struck out the next batter before Colby Langner grounded an RBI single through the shortstop hole and Harvey followed with a line drive down the right-field line to give Fort Fairfield a sudden 3-2 advantage. Bangor Christian tied the game at 3-3 in the top of the sixth as Brady Reed reached on an error and was sacrificed to second by Calvin Mercier before pinch-runner Adam Ford scored on two balks by Harvey. Fort Fairfield scored what turned out to be the winning run in the bottom of the inning as Dylan Jandreau drew a leadoff walk, stole second and scored on Wyatt Keegan’s single to right. Grass then returned to the mound and yielded a walk and an infield hit before recording the final out. Grass had nine strikeouts, two walks, and a hit batter while yielding just one of Fort Fairfield’s four hits in his 4⅓ total innings on the mound. Harvey also struck out nine and walked two while yielding one earned run during a 97-pitch effort.